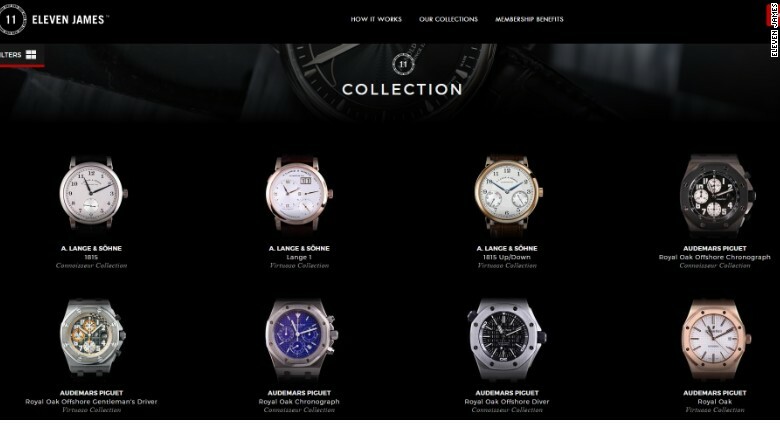 Eleven James lets customers rent luxury watches for several months at a time. When a watch costs $40,000, you don't want to end up with buyer's remorse. Enter Eleven James, a company that offers men the chance to try out a new watch for a few months at a time, by allowing its members to rent different luxury watches several times a year. Like NetJets, which lets customers buy à la carte flights on private planes, Rent the Runway for pricey party dresses and Bag Borrow or Steal for high-end handbags, Eleven James gives customers access to luxury watches they may not be able to afford or may just want to test out without the five-figure price tag and lifetime commitment. Users make two primary choices: what type of watches they want to wear and how frequently they want to change. There are currently three tiers, based on watches that retail for $10,000, $20,000 and $40,000. They then choose how many times they want to switch it up -- between three and six times per year. They fill out a preference sheet based on brands and styles they're interested in, and work with a concierge to figure out which watches they'll try next. Membership for the least expensive watches, brands like Breitling, Panerai and Rolex, start at $199 per month, or $2,150 per year. On the high end, for watches like Patek Philippe and A. Lange & Sohne, it can reach $1,379 per month, or $14,900 per year. In an age when a clock is displayed on any of the expensive electronic devices people already carry, why would anyone pay to borrow a device that only tells time? According to Randy Brandoff, Eleven James' founder and CEO, the watch is still what makes an outfit, and there's a tremendous amount of heritage and craftsmanship that many people, especially in the professional sphere, still appreciate. But because it's such a huge purchase, and a person can only wear one at a time, the idea of getting to try out a number of different watches without first having to buy one is appealing, he said. Santo Rosabianca is one customer who'd grown tired of his old Omega. But after signing up with Eleven James, he suddenly had new options that suited his tastes -- a Chopard Grand Prix de Monaco to fit his Formula 1 fandom, and an Italian-made Panerai to appeal to his Italian heritage. "Everyone I meet compliments me and it's brought me new business. It's a real conversation starter," he said. "I've been really blessed by it." Of course, it appeals to collectors who are intrigued by the idea of trying out all kinds of watches and models several times a year. But it's also bringing in a new customer. "We're seeing millennials who, as adults, are getting ever more curious," he said. "It's a pretty big leap to go from an iPhone to a Rolex, so they want to try them out." That's good news for the watch industry, since Brandoff said the company is attracting clients who weren't yet collecting or had become apathetic because they didn't have any variety. It makes sense, then, that 85% of its members said they were more likely to purchase a watch within the next year because of the service. Brent Handler was one of them. 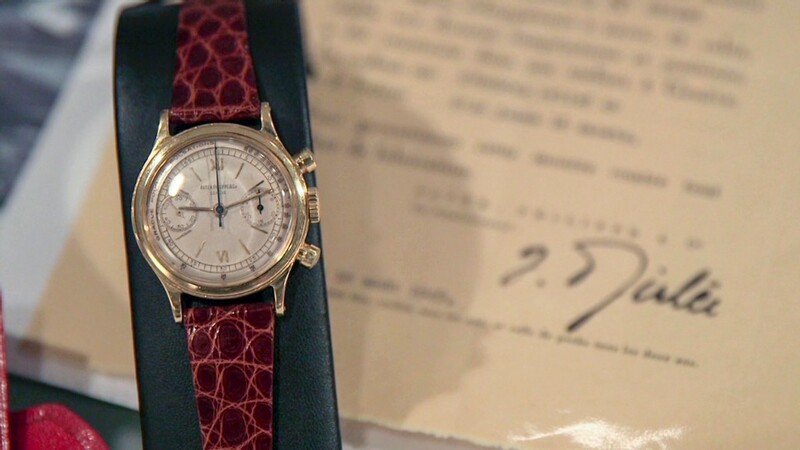 He ended up purchasing the first watch he was sent to try from Eleven James. He owned a Cartier watch his wife bought him before, and didn't think he needed to spend $10,000 on another one, until he became "enamored with" the Zenith watch he was borrowing. "I'm 46 years old. I have three kids. There aren't that many new things that I get to experience," he said. "But when I get a call six times a year from a concierge saying, 'what kind of watch do you want?' that's something to look forward to." Eleven James also avoids the regret that often comes with make a big watch purchase. Eric Wind, a contributor to the online watch magazine Hodinkee, said that many people lament that they didn't know that much about watches or didn't know what they would like when they bought an expensive watch, and then they're stuck with it. "Watch tastes typically evolve over time and the luxury watch rental services provide users with that commodity of time -- literally," he said.